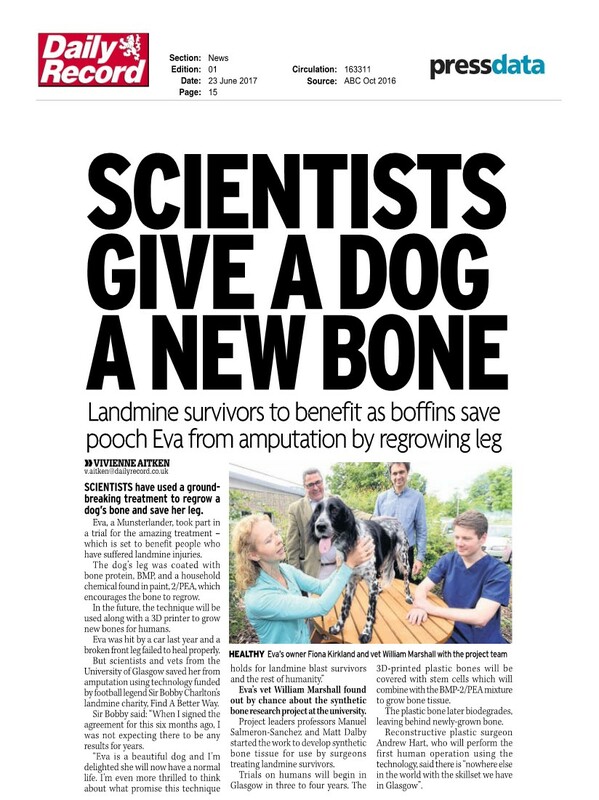 We have been shortlisted for the Times Higher Education Awards 2018 with our FABW funded project for bone repair technologies. We are in the Research Project of the Year: STEM category. The award ceremony is scheduled for the 29th of November in London. More details about the shortlisting and the project in this blog post in our funder’s website. Follow the story in Twitter too! What a thrilling experience this weekend at the Glasgow Science Center. It feels so great and cool to explain our work to people from all backgrounds and ages. Over this weekend we’ve seen many groups of kids and also parents and seniors. I start my pitch and look at their faces to adapt and make it simpler or go into further details. I talk about our work with bone regeneration technologies, new materials and understanding of stem cell biology. It’s amazing how much all people are interested and fascinated by science. Kids loved anything that can be touched, like our jelly experiments to test different stiffness of gels and our mystery box of hard and soft tissues. Kids and adults alike lit up when looking through the microscopes. We looked at samples of a bone chip and a 3D printed synthetic material mimicking the natural bone scaffold structure. We had stem cells that had been previously prepared in our labs to be differentiated to bone, muscle or fat cells, showing their different morphologies and features of the cells. Most adults that stopped and engaged with any of us stayed for the whole pack of talks and stations that we have prepared. Some kids and adults are not immediately interested or understand what we are talking about, and those challenges become also a very rewarding experience and a great test for our knowledge of the matter at hand. We’ve had for a few weeks a team at CeMi creating all the materials and activities at our stall. Most of it has been nothing super fancy, although it took quite some time and thinking to prepare, like gelatin gels with a range of stiffness, plastic 3D printed pieces for models, and posters and videos for the stall screens, all incredibly useful to help with talks and conversations. It has been very motivating to see how much people have enjoyed just talking to us. We looked really nice and sharp with our new polo shirts with the CeMi logo! The Curiosity Live event at the Glasgow Science Centre ran 15th – 17th June as part of the Glasgow Science Festival 2018, with researchers on hand to celebrate and share their exciting research with visitors. This post was written by Andres Alba-Perez from notes by Cristina Gonzalez-Garcia. Update February 2019 – The lifETIME proposal has been successful and is recruiting PhD students. Check the lifETIME CDT website here for full details. We heard last week that we have progressed to the full proposal stage with lifETIME, our Centre for Doctoral Training (CDT) bid that focuses on engineered tissues, in vitro models, for discovery and research. This is really exciting for us and means that we have just under two months to define how to better shape the UK landscape in non-animal technologies. For this we have been recruiting industry input and we have organised an ‘Industry Day’ next Wednesday 13th of June, with a truly interesting agenda and a very good representation of the industry in the field. The agenda can be seen at https://glasgow.thecemi.org/events/#iday. Email us here if you plan to attend. CDTs are large training initiatives and one of the main funding tools of the EPSRC for doctoral training. A CDT can usually support 50 to 80 studentships over 8-9 years. In our CDT the training will take place across the universities of Glasgow, Birmingham, Aston, and Galway. The UK is a world leader in the development of new medicines. In recent years, however, there has been a drop in the number of drugs that make the transition to clinical and commercial benefit. Many new drugs fail to make it through initial pre-clinical screens into trials. The high attrition rates of drug candidates suggest that present in vitro models (cell cultures) and in vivo models (animals) used to screen drugs are poor predictors of whether a drug really works. Thus, there is a move towards the development of non-animal technologies (NATs) closer to human physiology and more likely to predict efficacy. These include engineered systems comprising human cells placed in environments similar to those that may be encountered in the body, created using a range of advanced structuring methodologies including 3D printing, electrospinning, amongst others. 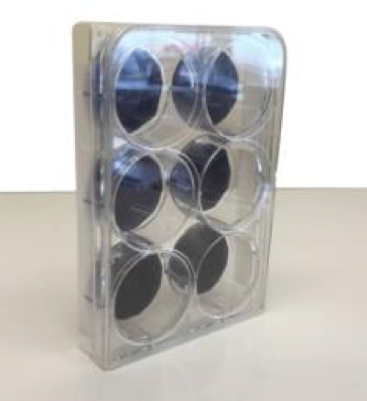 These may be placed in bioreactor systems that may simulate the in vivo environment, by providing compression, vibration, stretch or local flows, which may be modified with microfluidic systems. The response of these “tissues” to candidate molecules can then be assessed in real-time using a range of analyses (microscopy and mass spectrometry).The development of the above technologies is driven by engineers, but few are able to work across disciplinary boundaries. At present, the UK lacks a critical mass of such engineers and so we import talent from abroad. This CDT will train engineers in the skills needed to work with life scientists and clinicians and to develop NATS to screen drug cadidates. This will not only provide the skills needed to provide home-grown talent in this area, but also maintain the UK’s position as a global leader in medicines development that will sustain the UK economy. Our academic centres are well aligned in terms of research interest. We all focus on fabrication of novel materials for use in the body (biomaterials), lab-on-chip technologies (these are miniature labs where screening can rapidly take place) and tissue engineering (mixing cells with materials to make ‘off the shelf’ tissues). However, each institute focusses on a different technology readiness stage. Glasgow focusses on fundamental materials and their interactions with cells, Birmingham on taking novel materials into real world and Aston on industrial implementation of these technologies. Together with our club of industrial partners and our strong links to clinic, we can offer unprecedented, world-class, training in NAT development with industrial delivery. We will look after the students as year (and cross year) cohorts. We will provide teaching, activities and hands-on training in interdisciplinary science, responsible research and ethics, impact and translation and user engagement. The students will be regularly brought together for this training. This is essential to help the students become the interdisciplinary experts with strong community links that the UK economy is demanding. The full list of CDT proposals that made it to the final stage can be accessed here. This is a presentation post on the paper Tsimbouri, Childs et al. Stimulation of 3D osteogenesis by mesenchymal stem cells using a nanovibrational bioreactor. Nat. Biomed. Eng. 1, p 758–770 (2017). By Dr Monica P. Tsimbouri. People live longer but our body parts cannot keep up, we need new therapies for a better quality of life for our ageing population. 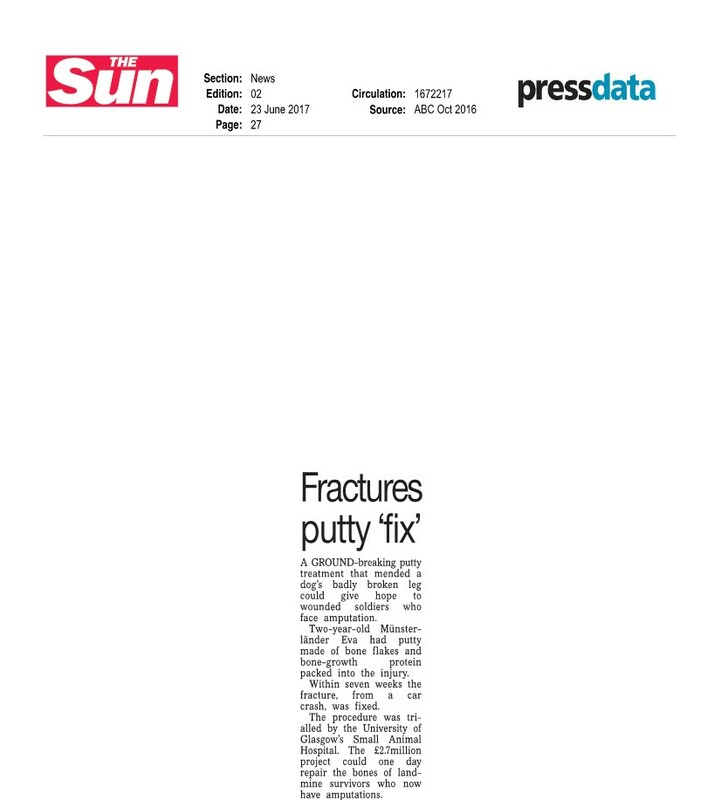 This is particularly true for bone repair as better therapeutics are needed for age related fractures including spinal traumas, osteoporosis and stress fractures. This attracted physicists and cell engineers in Glasgow to develop a new technique that is cheaper and easier to implement than current technologies. That technique is Nanokicking stem cells to grow new bone. This work brought together cell engineers, Professor Adam Curtis, Professor Matthew Dalby and Dr Monica P Tsimbouri (myself) at the University of Glasgow, and physicists, Professor Reid and Dr Peter Childs, both at the time at the University of West of Scotland. The late Emeritus Professor Adam Curtis observed that cells seem to “tiptoe” across surfaces and wondered what would happen if you vibrated the surface back at the cells. This inspired the idea of using nanovibrations in the lab. Modular design allows incubator use, no complex perfusion. The cells used in work are stem cells. Stem cells can be stimulated to change into different cell types such as bone, cartilage, ligament, tendon and muscle. In the lab, this stimulation is typically done by using complex and expensive engineering or cocktails of chemicals. Using nanovibrations to direct stem cell behaviour to generate bone cells doesn’t require dangerous or expensive tools. Nanovibrations are naturally experienced by our organs as we breathe, walk and move. Stem cells respond to these unique vibrations to regenerate damaged tissue. These vibrations have specific frequencies unique for different tissues and are measured in hertz (Hz) e.g. for bone around 970Hz. Nanokicking makes use of the fact that during the bone healing process the individual cell membranes vibrate as they adhere. By vibrating the stem cells at the bone’s unique frequency stimulates the cell interaction and promotes bone formation. We can replicate this vibration by ‘kicking’ the stem cells in the lab using our Nanokicking bioreactor around 5-30 nanometres vertically at 1,000 Hz (1,000 times per second). Dr Childs (Peter, the physicist of the team) developed the current form of the bioreactor. Peter fine-tuned the strength and frequency of the nanokicks using laser interferometry which amongst other things is used to detect tiny ripples in space-time caused by gravitational waves! Magnetic attachment of standard format culture plates/flasks. The systems is compatible with 3D scaffold materials (e.g. collagen). Myself, the cell biologist, with some help from my friends at the CCE (Gabriel, Jingli, Wich, Vineetha) nanovibrated stem cells from the bone marrow into bone-making cells on a large scale without the use of cocktails of chemicals or challenging and complex equipment. I used collagen as my scaffold, to study and analyse the effects of nanovibrations on stem cell phenotype in 3D. I found increased expression of osteogenic genes and proteins in the nanokicked gels with stem cells. Even more, mineral crystals were formed indicating the early changes towards bone development. The use of collagen in this 3D study provided mechanical integration through its direct interaction with the plastic 6-well plate walls. Hence, we don’t need to use dense osteogenic scaffolds, e.g. calcium phosphates which have some limitations. In addition, the collagen gel is very soft with no osteogenic effects. Our team is multidisciplinary and this brings a lot of challenges as researchers need to learn new scientific languages. This collaboration between cell biologists and astrophysicists has yielded new insights as to how bone stem cells work, how they respond to nanovibrations previously at 2D and now at 3D level with the potential of developing bone grafts for translational therapies. 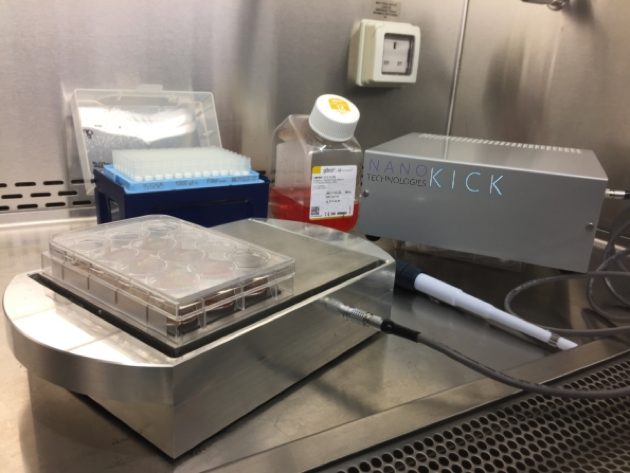 We can generate 60 ml of mineralizing osteoblasts in an appropriate 3D matrix gel from stem cells on a single bioreactor! 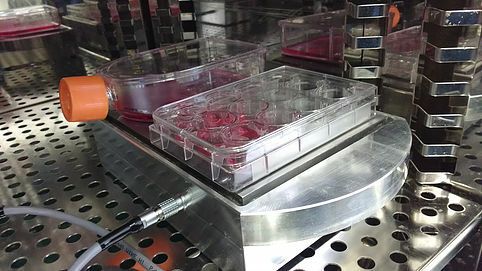 The Nanokicking bioreactor being used in a cell culture hood. At the start of 2017 our team received funding from Find a Better Way, a charity funded by Sir Bobby Charlton to develop technologies that can help landmine and blast injury survivors. 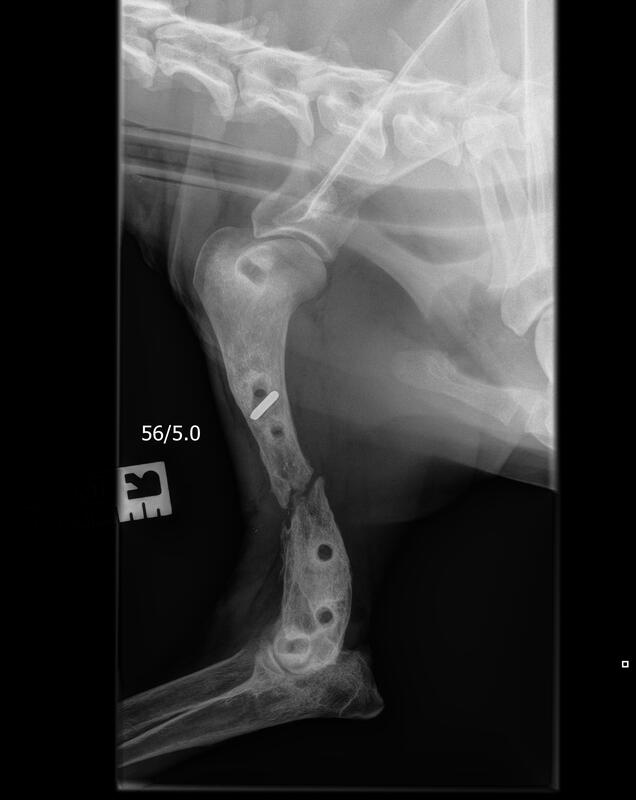 In this project we are now working with clinicians (Prof Andrew Hart, Prof Dominic Meek, Royal Navy Captain Rory Rickard) to tackle the challenges of translating the Nanokicking technology to better bone therapeutics. In this project we plan to run a first-in-human trial of the technology for the reconstruction of complex fractures of fingers of the hand, and we will test pre-clinically the combination of nanokicked cells with the use of a functional polymer coating technology also developed by CeMi researchers, to advance in the development of bone grafts for larger bone defects. 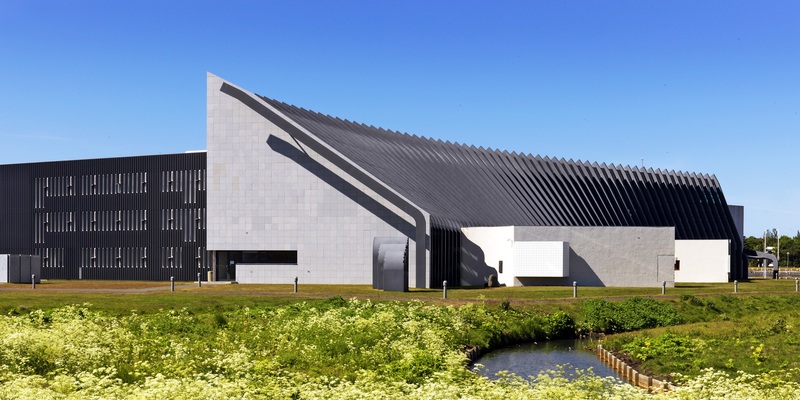 This international workshop takes place at the University of Iceland this week and gathers researchers from multidisciplinary domains on the use of advanced materials in distinct biomedical fields, including diagnosis/imaging, medical devices, nanobiomaterials, tissue engineering and regenerative medicine, drug delivery or bioengineering applications. Dr Marco Cantini, currently a postdoctoral researcher at the Centre for the Cellular Microenviroment, has been awarded an MRC UKRI Rutherford Fund Fellowship to develop Engineered microenvironments to harvest stem cell response to viscosity for cartilage repair. This fellowship is part of the National Productivity Investment Fund investment in UKRI Innovation and Rutherford Fund Fellowships, awarded by the MRC in alignment with the UK Regenerative Medicine Platform (UK RMP) initiative. As such, the science of Dr Cantini’s proposal has been judged to align to the aims of the UK’s Industrial Strategy, within the context of excellence in medical sciences. Several BBC News Channel clips (radio prerecorded package followed by interviews with Matt, William, and Fiona & Eva – the last of these interviews was run as a recording several times more). Radio 4 PM – Prerecorded interview with Matt (from World at One) plus live interviews with Fiona and Stuart. BBC World – Manuel’s and Lou’s interviews.